Fox squirrels are the most common type of tree squirrel found in Nebraska, although you can also find gray squirrels here, particularly in the Missouri River valley. Fox squirrels can be brown or black, and are commonly seen in neighborhoods throughout the state. Fox squirrels make large nests of leaves and other plant matter, and generally have two litters per year, one in March and one in later July or early August. Although fox squirrels eat primarily a plant-based diet (nuts, seeds, roots, fruits, and vegetables), they are omnivores and will eat insects, eggs, and even baby birds. A baffler is a large plastic or metal cone or dome that is installed upside down on a bird feeder pole or tree (either under the feeders, above the feeders, or both). 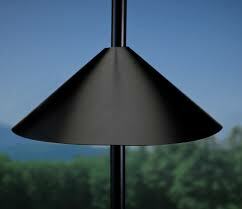 The baffler, if placed properly, will prevent a squirrel from climbing up or down to your feeders. You can buy bafflers at most wild bird stores or create your own out of sheet metal or a large aluminum mixing bowl. Fill your feeder with foods that squirrels won’t want: safflower seed (which attracts species such as cardinals, chickadees, and titmice), nyjer thistle (which nourishes goldfinches and others of their kind), or a birdseed mixture that includes a large amount of white proso millet seed (which satisfies the hunger of mourning doves and house finches). 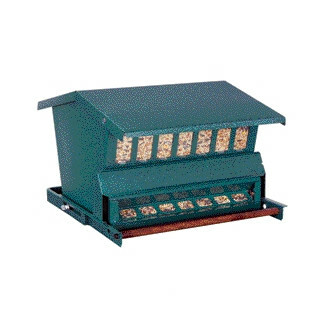 Many wild bird and home & garden stores will carry a variety of squirrel-proof bird feeders. Some of these have special levers that will close the feeder under the weight of a squirrel, but remain open when the lighter birds perch on them. Others will have a cage around the feeder that small birds can enter, but squirrels cannot. Place a battery-operated radio as close to the nest area as possible, tuned to a heavy metal or talk radio station. Leave the radio turned up as loudly as possible and run it continously for at least 24 hours. Soak old rags in coyote urine and stuff them in the chimney or eaves, or simply spread coyote urine around the entrance point to the nest. Allow the squirrel several days to move her babies out of the attic or eaves. To ensure they are gone, stuff the entrance with wadded up newspaper and wait 24 hours. If the newspaper is unmoved, the animals are gone. Once you're sure the squirrels have left, prevent further problems by installing an approved chimney cap or repairing and sealing attic openings. Make the wrap using sheet metal such as tin or aluminum. 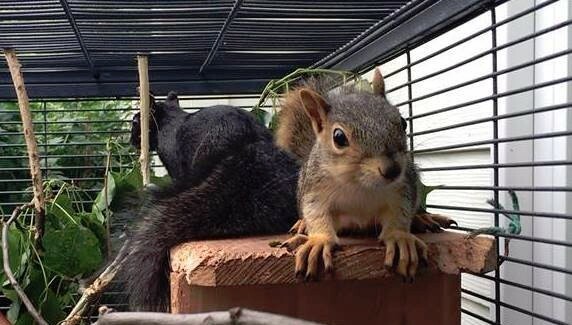 It should cover a section of the trunk at least two feet tall to prevent the squirrels from climbing past it, and should be situated six feet from the ground so that squirrels can not leap beyond it from the ground. It’s important that you remove the wrap after harvesting your fruit or it will eventually deform the tree. The trunk above and below the metal barrier will continue to grow and increase in diameter while the portion of the trunk that is wrapped in metal will not grow. You can use the same piece of metal for next year’s fruit season it’s just that it can not remain on the tree all year long. 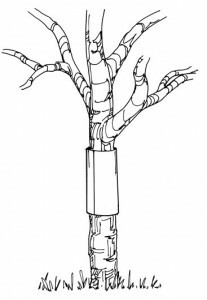 Trim back the lower branches of your trees and trim the branches back from other trees and buildings the squirrels might use to access the trees.